Before Street Magic, before Restaurant Magic and before Walk Around Magic there was Table Magic where a magician would join audiences at their table in a restaurant or bar and entertain them. 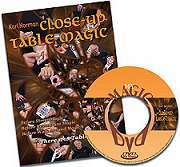 Karl Norman has spent more than 50 years as a professional magician and on this DVD he explains the routines he uses when performing close-up table magic. Karl also performed behind the bar at the famed Forks Hotel in Buffalo, New York for more than 25 years and shares the routines he used when working with Eddie Fechter. 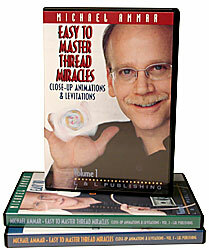 In addition to learning all the magic on this DVD you will experience Karl's charming, funny and often corny presentations that make him a lovable magician and entertainer. The Coin Collection - A copper, silver, brass coin box routine using three coins from different countries that jump from hand to hand, appear in the box, change places with the box and for a finale the box becomes a solid slug of brass. Whole Hole - A double backed red card with a big hole in it and four double backed blue cards are used for some impossible transpositions and color changes. The Coin In The Bottle - A half dollar is made to penetrate the center of a bottle that is being held by a spectator. The coin falls out of the bottle just as easily. The Invisible Sky Hook - A knot tied on a rope is ripped off and hung on an imaginary sky hook. The invisible knot is now plucked from the air and appears back on the rope. Matchboxes Routine - Karl's routine for the Sympathetic Matchboxes where two boxes act unnaturally when one drawer is closed or opened the drawer in the second box opens and closes on its own. The finale to the routine uses a matchbox with a slit cut through it where a ribbon is threaded and unthreaded through the opening. What makes it impossible is a solid piece of steel that has been in the box the whole time. The Shrinking Giant - Two red cards a black card are displayed. The black card is placed in between the two red cards as it is seen to grow to twice its length and then twice its width. The routine concludes with the black card shrinking into a miniature card. 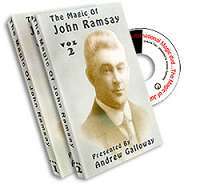 Card To The Case - A signed card vanishes from the deck and appears inside a card case that was in full view throughout the routine. The Card On The Forehead - A card is thought-of and a card is placed on your forehead. Amazingly the card on the forehead turns out to be the thought-of card. Ring Flight - A borrowed finger ring vanishes under impossible conditions and appears inside a key case. Change Of A Quarter - Two cards are selected. One is cut into quarters and changes places with the first selected card that is being held by a spectator. The four pieces are gathered and restored to a whole card. Bill In The Cigarette - A corner is ripped off a borrowed bill and the bill is placed in an envelope. The bill vanishes and appears inside a borrowed cigarette. The previously ripped corner matches perfectly to the bill in the cigarette. Key Card Routines - Two selected cards are lost in the deck. A spectator names a number from 10-20. You cut that number of cards and find the first card. The second card is found by the spectator. Another card is selected and found in your pocket. Linking Pins - A quick routine with two safety pins that penetrate each other, move across the length of a handkerchief, penetrate through a handkerchief and finally link to each other. Card On The Ceiling - Karl's best known routine that is currently being used by most bar magicians. A signed card is lost in the deck. Rubber bands are placed around the deck and the deck is tossed at the ceiling. The deck falls back down but the signed card remains stuck to the ceiling. 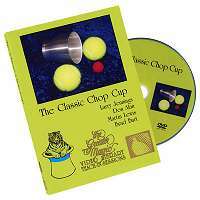 The Three Shell Game - The classic gambling game using three metal shells and a pea where the spectators cannot follow where the pea is. The routine builds as the sequences become more impossible and concludes with a surprise ending. It's The Nuts - Karl's handling to Finn Jonn's brilliant routine where a nut and a bolt separate under impossible conditions. Torn And Restored Cigarette - A borrowed cigarette is torn in half and restored. 1 hour and 50 minute running time. A Meir Yedid Product.